Experimental design for in vivo LPS challenge of C57BL/6 mice and disease index post–LPS insult. False-color Raman images of CD4+T cells and CD8+ T cells from control and LPS-treated animals after day 1, 4, 10, and 30 obtained by k-means cluster analysis. (A) Representative false-color Raman images of CD4+ T cells and CD8+ T cells from control and LPS-treated animals after day 1, 4, 10, and 30 obtained by applying k-means clustering method. The x-axis and y-axis show step size (0.3 μm) used for Raman imaging. The k-means algorithm was executed to find four different clusters of spectra for each time point in the cells recovered from spleen of control and LPS-treated animals. The four clusters are represented by blue, cyan, green, and red color in the image. Blue cluster represents the narrow cytoplasm region of the T cell, cyan and green cluster highlight the nucleus, and red cluster is a mixture of the outer parts of the cell and remaining background contributions. The contribution of each cluster has been represented on right side of individual cells as cluster scores. (B) Corresponding Raman spectra of the four clusters obtained from k-means analysis using the same color code as in (A). 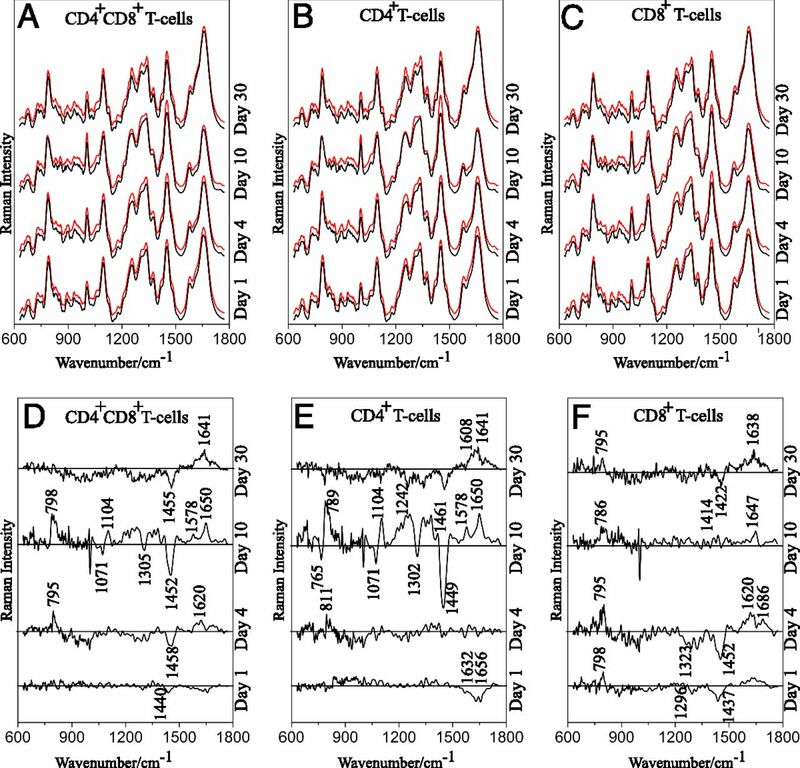 Mean and difference Raman spectra of T cells isolated from spleen of sham mice and endotoxemic mice for time points 1, 4, 10, and 30 d.
Top row: mean Raman spectra of (A) CD4+CD8+ T cells, (B) CD4+ T cells, and (C) CD8+ T cells isolated from spleen of sham C57BL/6 mice and LPS-insulted C57BL/6 mice (time point of LPS insult is shown on right axis). Bottom row: difference Raman spectra between (D) CD4+CD8+ T cells, (E) CD4+ T cells, and (F) CD8+ T cells from sham mice (spectra in black) and LPS-insulted mice (spectra in red). Negative peaks belong to LPS-treated cells, and positive peaks belong to healthy cells. The spectra are shifted in y-axis for clarity. For each time point, pooled spleen obtained from 9 to 12 mice (both male and female) per condition have been used (see Supplemental Table IA). A minimum of three biological repetition and Raman spectroscopic investigations were done for each time point (see Supplemental Table IA). T cells were isolated, and CD4+ T cells and CD8+ T cells were purified using automated negative magnetic-assisted cell sorting using standard isolation kit. PCA-LDA of Raman spectra of T cells isolated from spleen of sham mice and endotoxemic mice for time points 1, 4, 10 and 30 d.
Top row: Raman model using PCA-LDA for (A) CD4+CD8+ T cells, (B) CD4+ T cells, and (C) CD8+ T cells isolated from spleen of sham C57BL/6 mice and LPS-insulted C57BL/6 mice (time point of LPS insult is shown on x-axis). 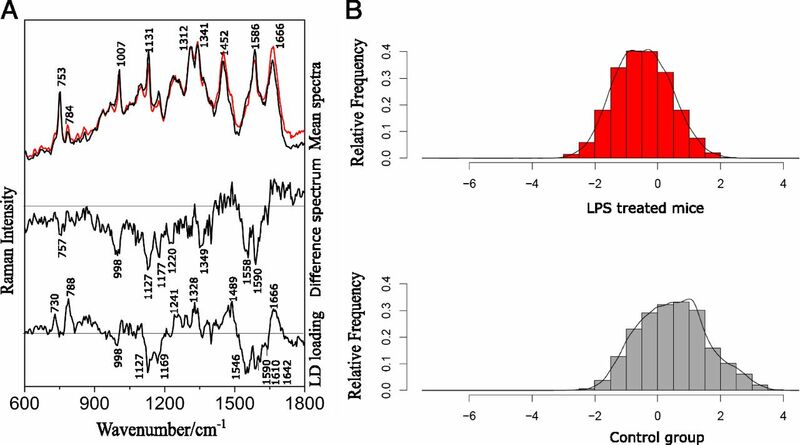 In the bar plots, the bar represents mean along with the SE; black and red bars represent respective control and LPS group. Bottom row: ROC curve for (D) CD4+CD8+ T cells, (E) CD4+ T cells, and (F) CD8+ T cells from sham mice and LPS-insulted mice. For each time point, pooled spleen obtained from 9 to 12 mice (both male and female) per condition has been used (see Supplemental Table IB). At least three biological repetition and Raman spectroscopic investigations were done for each time point (see Supplemental Table IB). 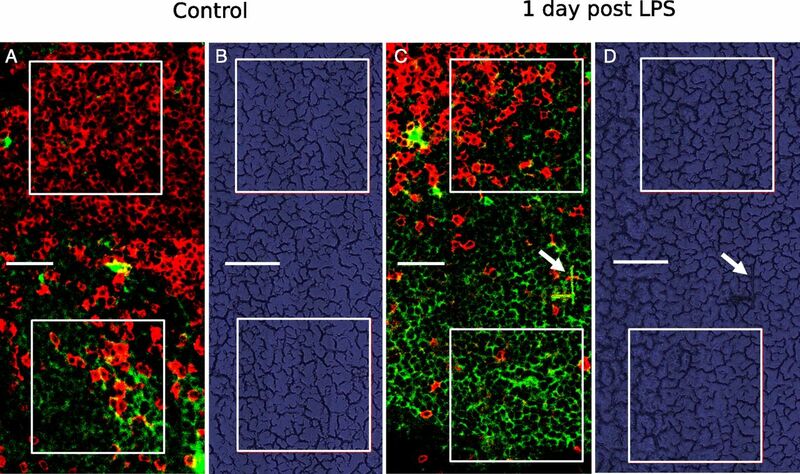 T cells were isolated, and CD4+ T cells and CD8+ T cells were purified using automated negative magnetic-assisted cell sorting using standard isolation kit. Mean and difference Raman spectra of spleen tissue from endotoxemic mice and sham mice and PCA-LDA. (A) Mean Raman spectra of spleen tissue of sham C57BL/6 mice and C57BL/6 mice 1 d post–LPS treatment, difference spectrum between control and LPS-treated mice spleen tissue (label on right y-axis), and loading of PCA-LDA model for spleen tissue section differentiation of control and LPS-treated mice (label on right y-axis). (B) PCA-LDA histogram plot. The biological experiments were repeated four times; in each repetition one mouse per condition was used (in total four mice per condition; both female and male mice were used) (see Supplemental Table IB). Raman spectroscopic investigation was performed on three different days. Three tissue slices were investigated per spleen. Analysis has been done on pooled samples. False-color Raman images of spleen tissue sections from control and LPS-treated animals obtained by k-means cluster analysis. (A) Representative Raman false-color images of spleen tissue sections from control mice (four animals, mouse A, B, C, and D) and LPS-treated mice (four animals, mouse E, F, G, and H) obtained by k-means cluster analysis. The x-axis and y-axis show step size (3 μm) used for Raman imaging. The spectra were processed to remove cosmic spikes and background corrected using SNIP algorithm. Raman fingerprint region (600 cm-1 to 1800 cm-1) has been used for analysis. The k-means algorithm was executed to find ten different clusters of spectra from control and LPS-treated animals. The contribution of each cluster as cluster scores has been represented on right side of the individual tissue sections as cluster scores. (B) Corresponding Raman spectra of the clusters obtained from k-means analysis using the same color code as in (A). Spectra of clusters 1, 4, 5, 8, 9, and 10 are shown, whereas k-means cluster spectra 2, 3, 6, and 7 are omitted, as they correspond to individual image pixels with high fluorescence background that were registered on the spectrometer detector. 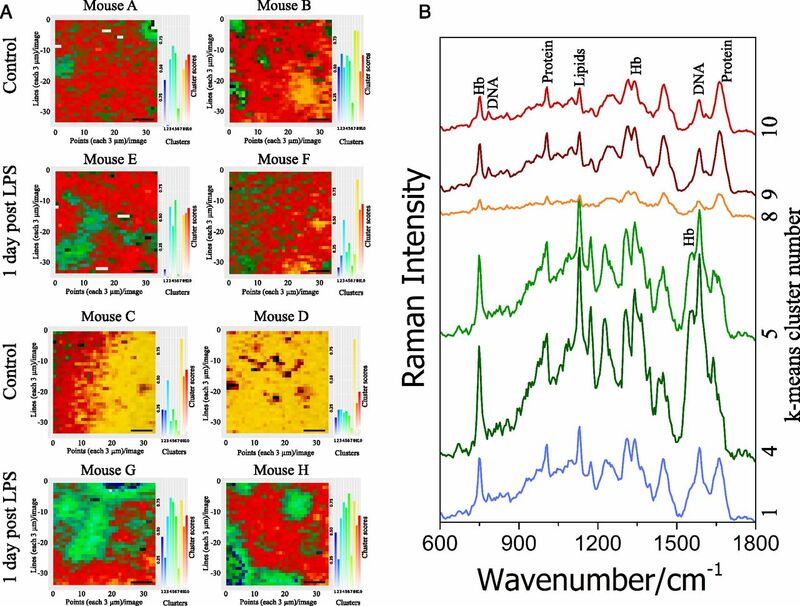 Fluorescence-stained images and respective bright-field images of mouse spleen tissue sections area investigated using Raman spectroscopy. (A) Fluorescence-stained images (A and C) and bright-field images (B and D) of C57BL/6 mouse spleen cryosections of (A and B) sham mice treated with 0.9% saline water (C and D) 1 d post–LPS treatment. T cells were labeled with rat anti-CD3 Abs and detected using donkey anti-rat Alexa Fluor 555 (red color). B cells were labeled with donkey anti-mouse IgG Alexa Fluor 647 (green color). Images were collected using original magnification ×40 objective. Scale bar, 40 μm. The white squares represent regions scanned using Raman spectroscopy. The arrows indicate position of laser-induced mark on tissue section for correlation of the Raman-scanned region before and after fluorescence staining. Representative images from two sham mice and two LPS-treated mice from two separate biological experiments are shown. Pie charts (for all the mice together) and bar graph (for individual mouse) showing relative percentage of T cells and B cells present in the Raman spectroscopy–investigated area and entire fluorescence images of spleen from C57BL/6 mice spleen tissue sections. Pie chart showing ratio of T cells and B cells present in the investigated spleen tissue sections, (A) in sham mice only from the Raman spectroscopic–imaged regions, (B) in LPS-treated mice only from the Raman spectroscopic–imaged regions, (C) in sham mice from entire fluorescence images, and (D) in LPS-treated mice from entire fluorescence images. 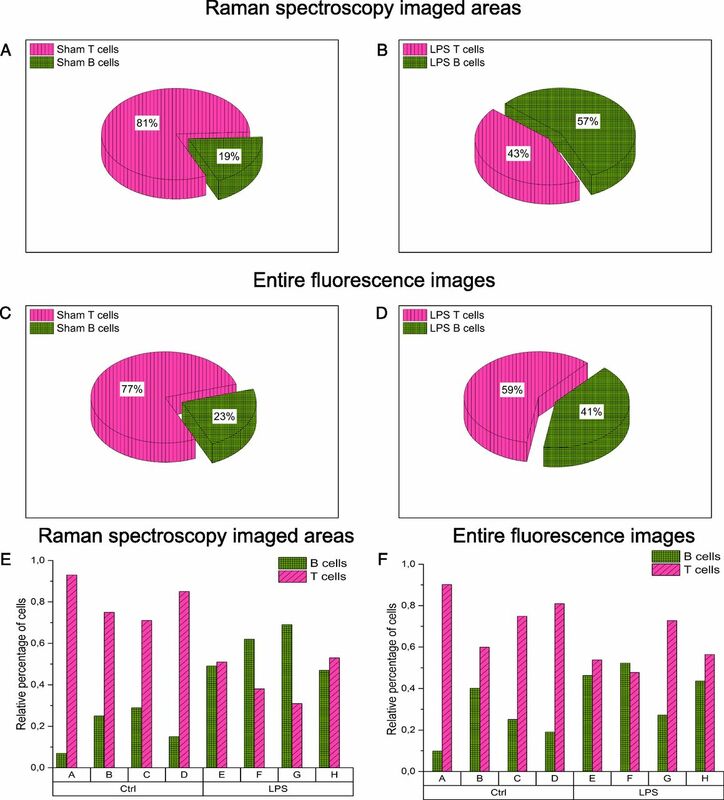 Bar graph presenting relative percentage of T cells and B cells present in the fluorescence images of individual mouse spleen tissue section, (E) only from the Raman spectroscopic–imaged regions, and (F) from all the fluorescence images. 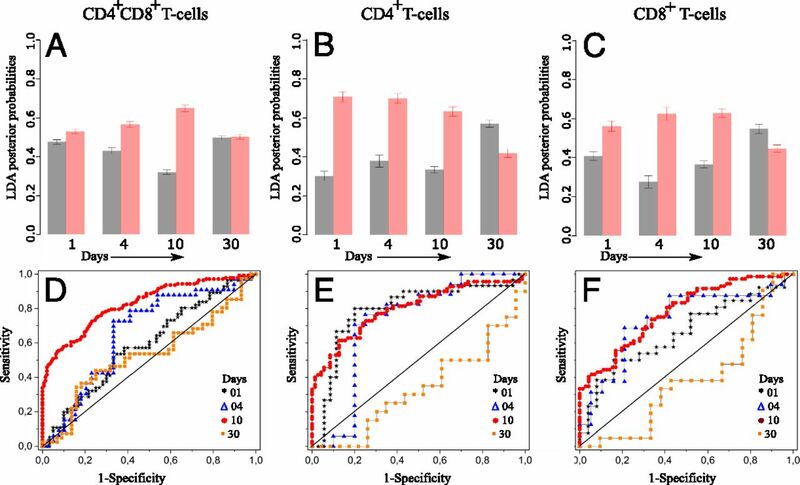 To evaluate changes in the proportion of B cells and T cells in the investigated mice, the ratio of the areas covered with the respective fluorescence marker was calculated. The biological experiments were repeated four times with one mouse per condition. Three tissue slices were investigated per spleen. Mouse of strain type C57BL/6 were investigated using confocal fluorescence microscopy.